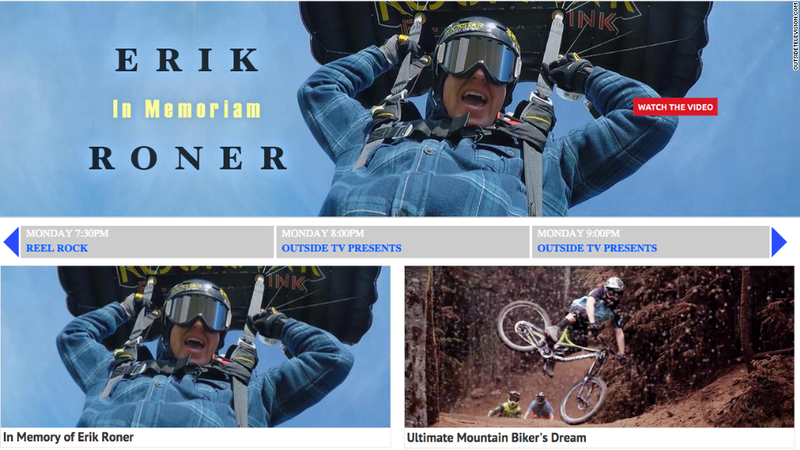 Erik Roner, an extreme athlete whose feats were seen regularly on MTV and Outside Television, died Monday in a parachuting accident, California authorities said. Witnesses told the Placer County Sheriff's Office that Roner was participating in a group skydive at the Squaw Valley Institute's annual Celebrity Golf Tournament. "One of the skydivers impacted a tree while attempting to land and became entangled with the tree high above the ground," the office said. "Rescue personnel were able to remove the skydiver from the tree; however, he was pronounced deceased at the scene." The other skydivers landed without incident. Roner, a native of northern California, cultivated a fan base with his breathtaking ski-BASE jump excursions. He was featured on the MTV series "Nitro Circus" and in 2012's "Nitro Circus: The Movie." One of his YouTube videos has nearly half a million views. He was also a host of the series "Locals" on Outdoor TV, a niche cable channel. "RIP," fellow MTV star Johnny Knoxville tweeted Monday night. "You will be missed my friend." "There are no words that can express this tremendous loss to the Outside Television family," Rob Faris, the channel's senior vice president of programming and production, said in a statement Monday evening. "Erik was not only a colleague, but also a personal friend, and it was a joy to watch him celebrate life on a daily basis," Faris said. "We are still trying to process this tragedy. Our hearts go out to his family." Roner's biography on his web site ends with a quote from Hunter S. Thompson: "Faster, faster, faster until the thrill of speed overcomes the fear of death." Roner is survived by his wife Annika and two children.